If you have pre-diabetes you may be sensitive to gluten, have wheat intolerance, or even Celiac disease. Gluten is in all flours containing wheat and will be the main ingredient in most restaurant and commercial pizza crusts. If you feel bloated after eating pizza it may be the gluten in the crust. Chef Janet is a professional chef who has devoted her cooking business to helping those of us who cannot, or do not want to consume gluten eat healthy without feeling like we have given up “good tasting” food. 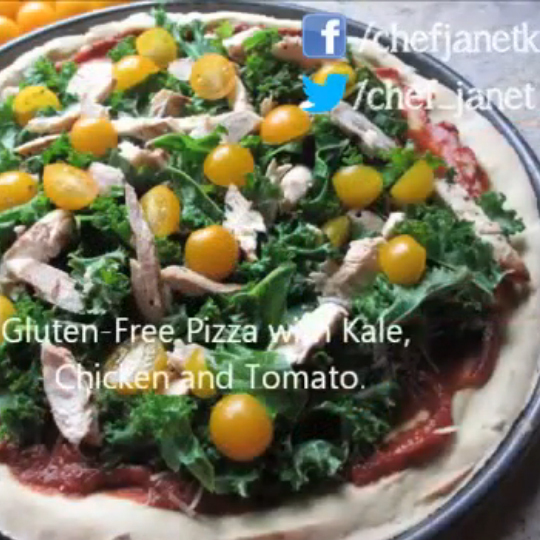 She created this gluten-free pizza crust recipe to offer a symptom-free alternative to gluten based crusts. Without the gluten, you may find your body doesn’t overreact and you can enjoy pizza again!